Do you suspect you may have developed physical addiction to Percocet? Read this article to learn how physical Percocet addiction is formed, how you can recognize it, and treat it. To be able to recognize a problem with Percocet in yourself or someone else, you need to know the difference between physical and psychological dependence. At its most basic, addiction doctors and professionals diagnose possible psychological dependence (addiction) when an individual begins to rely on the medication as a solution to a variety of emotional and psychological problems. So, what happens when you are physically addicted to Percocet? What are the signs? If you think that you or a loved one are physically addicted to Percocet, you’re in the right place! Here we’ll review the signs and signals of Percocet physical dependence. We’ll explain the main factors that differentiate addiction from dependence and list available treatment options. At the end, we welcome your questions and comments. Physical dependence is defined as a state of adaptation. In fact, it’s a normal and predictable effect that usually occurs after continued use of opioid drugs like Percocet (main ingredient oxycodone). Physical dependence occurs after daily dosing anywhere from 3-6 weeks of use. This condition is characterized by withdrawal syndrome that occurs as a result of abrupt discontinuation or rapid dose reduction. Compared with physical dependence, addiction is diagnostically different. First, addiction is a chronic condition that affects the brain’s reward center. It is characterized by compulsive drug use, obsession with obtaining and using the drug, cravings, and a continued drug use despite the physical, psychological, social harm. So, rather than manifesting as physical need for Percocet (this is dependence)…addiction comes with a psychological need. Percocet addicts need Percocet to function normally, not only to avoid withdrawal, but to cope with life. There is a number of signs and signals that can serve as red flags when it comes to Percocet addiction. If you recognize the following changes in yourself or in a loved one, it may be due to the development of addiction to the drug. Continued use of Percocet despite any physical, psychological, work, social, financial, or legal harm it causes. Inability to quit and/or control Percocet use (amount and/or frequency). Prioritization of using Percocet over all other daily activities. Spending money and time thinking how to obtain Percocet. Taking more Percocet than directed by your doctor. When you or someone you know experiences any of these signs and symptoms, you should seek assessment for possible problems with Percocet. The earlier the problem is identified and addressed, the better chances a person has for a successful recovery. If you recognize the listed signs of addiction… you shouldn’t worry or fear judgment. Addiction is a medical condition and is treatable. Help for Percocet addiction is available. 1. Assessment and evaluation. When you seek the help of medical professionals, they will first evaluate your state and assess the severity of possible addiction. Doctors will also evaluate your physical and psychological health state. At this point, your treatment plan will be tailored to your specific needs. 2. Medical Detoxification. After addiction to Percocet is diagnosed, you will need to go through detox if you are physically dependent on Percocet. A medically assisted detox treatment is the process during which Percocet is eliminated from your body. The help of medical professionals is required during detox, because stopping use can be an extremely uncomfortable and even risky if done on your own. Doctors, nurses, psychiatrists, and aides will help monitor your symptoms and can administer medicines to make withdrawal less severe or intense. Percocet withdrawal symptoms typically last 3-5 days. Medical supervision is usually provided as part of a residential treatment facility to eliminate any dangerous or life threatening consequences. 3. Medication Assisted Treatment. Medications may also accompany Percocet addiction treatment. Some medications are used to ease the acute discomfort of withdrawal symptoms as they occur, and can make the detox process more comfortable. Others, serve as a replacement for Percocet and help patients quit, while still providing some kind of pain management. 4. Behavioral Therapy and Counseling. 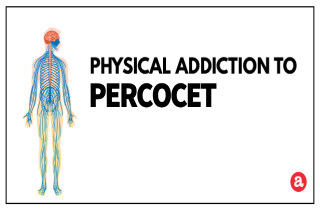 Percocet addiction is a process that requires long term devotion and treatment. During the rehab and recovery period, it is of utmost importance to address all aspects of the addictive behavior. This is the reason why behavioral therapy and counseling are an important element of Percocet addiction treatment. Cognitive Behavioral Therapy (CBT) is often used to help patients identify, avoid, and cope with situations in which they are most likely to abuse drugs or activities. The technique of Motivational Interviewing is intended to remind people of their values, as a way of avoiding drug use. Family Therapy may be provided to help the patient maintain a supportive environment and improve family functioning. Rehabilitation programs also help people in recovery to work on regaining necessary job skills. Want to know more? All of your questions regarding physical Percocet dependence are welcomed in the comment section below. We try to provide a personal and prompt response to all legitimate inquiries. In case we do not have the information you seek, we will redirect you to experts who can help.